Concerto for Piano and Orchestra E flat major, KV 482 (Concerto for Piano and Orchestra). Composed by Wolfgang Amadeus Mozart (1756-1791). Edited by Horst Heussner. For piano solo, orchestra. This edition: Paperback, Urtext edition. Paperback. Barenreiter Study scores. Study score. Language: German/English. KV 482. 92 pages. 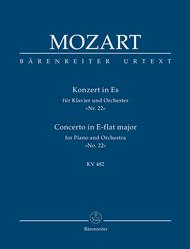 Published by Baerenreiter Verlag (BA.TP149).ISBN 9790006201273. With Language: German/English. 22.5 x 16.5 cm inches.